Born in Gifu prefecture, 1944, Wakou started painting under his father from his earliest childhood. His father was a painter too. Wakou became a disciple of Shikou Kojima who was also from Gifu prefecture and a nationally famous painter. Wakou received formal artistic training from Shikou and showed a skill for almost everything; birds and flowers, landscape and people. A former member of 墨人(bokujin) society. Now he belongs to Oriental Art society and is still active on the front line of Japanese art world. Japanese people love viewing cherry blossoms. Illuminated cherry blossoms at night are fascinating beyond words. The moment the cherries in both full bloom and out of bloom had been regarded as precious and irreplaceable. Cherries only last for a time but their transient beauty is so captivating to Japanese. Wakou depicted each petal’s color and shape very well. 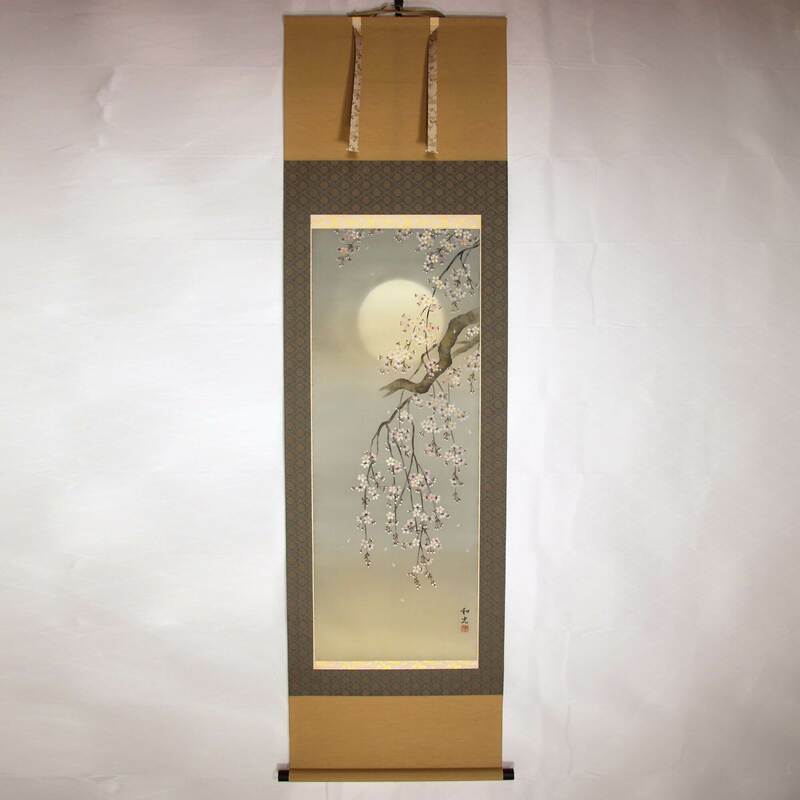 Thin black sumi ink on the background tells us it is at night and accentuates the beauty of the moon. The depiction of falling petals provides sense of lively motion and makes us feel cherry blossoms are having the time of their lives. Techniques of Wakou can be seen everywhere.